These compressed air dewpoint monitors have been designed to offer the highest level of reliability and accuracy available in such systems. They are fully NIST traceable and employ a chilledmirror sensor, the most accurate dewpoint sensing scheme available, to deliver consistent drift-free measurements without regular calibrations or sensor replacement. 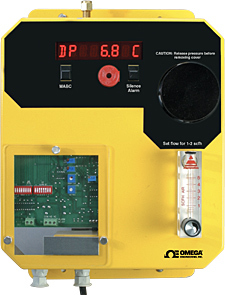 These compressed air monitors are complete dewpoint measuring systems. The ruggedized aluminum NEMA 12 (IP55) enclosure houses the sensor, control circuitry (including flow control) and is easily wall mounted to conserve space. Only the sample line and power connection are needed for the system to be operational. The monitors also offer a programmable automatic balance control (ABC) cycle that corrects for the light-reducing effects of mirror contaminates and allows for continuous monitoring and virtually maintenance-free operation. Compliance: 9.0 Vdc, 450 .